A couple months ago I saw a post somewhere about this little purple thing for cutting units apart when chain piecing. 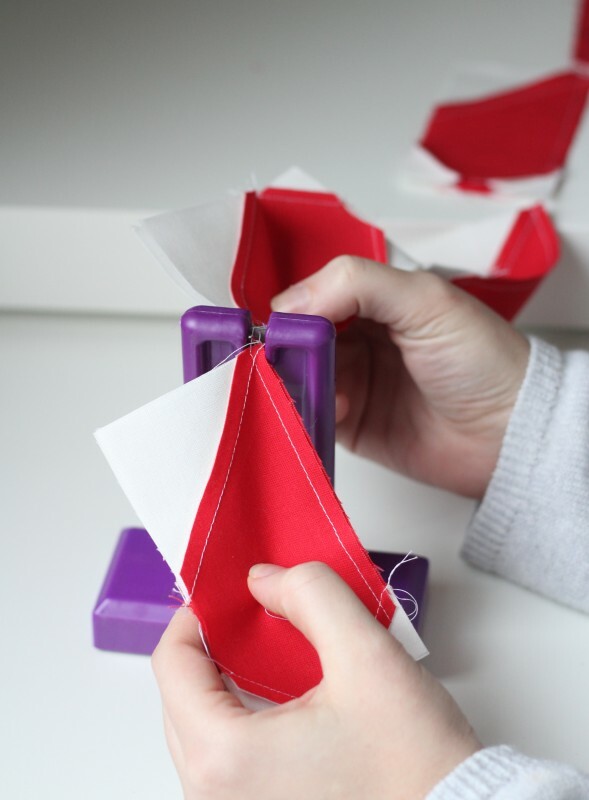 I love chain piecing…but I’ve noticed after years of quilting and working as a hygienist, all the repetitive snipping with little scissors make the tendons in my wrist a bit sore. I love this thing. I wish it was a bit shorter, but besides that it has cut my snipping time in half and my wrist doesn’t get sore anymore. I tend to chain piece my units very close together, and I’ve yet to snip anything but the thread in between by accident. I bought mine on Amazon but a quick google search also found them here and here. 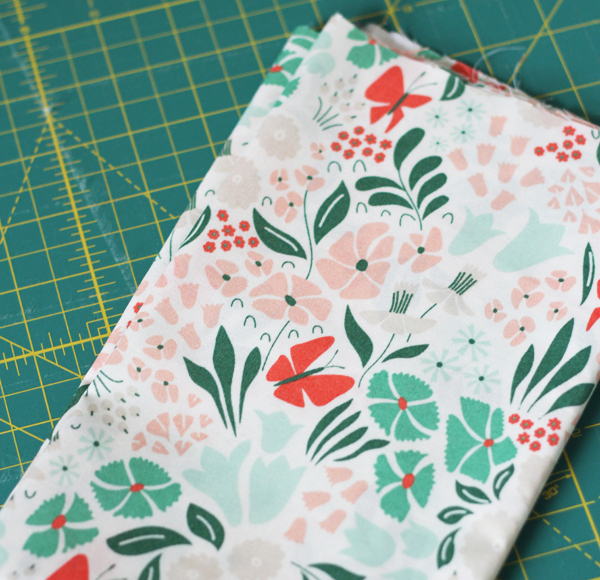 I ordered a bit of this Park Life collection by Elizabeth Olwen for Cloud 9 fabrics because I love that print up there. Prints with multiple colors like it are my favorite. 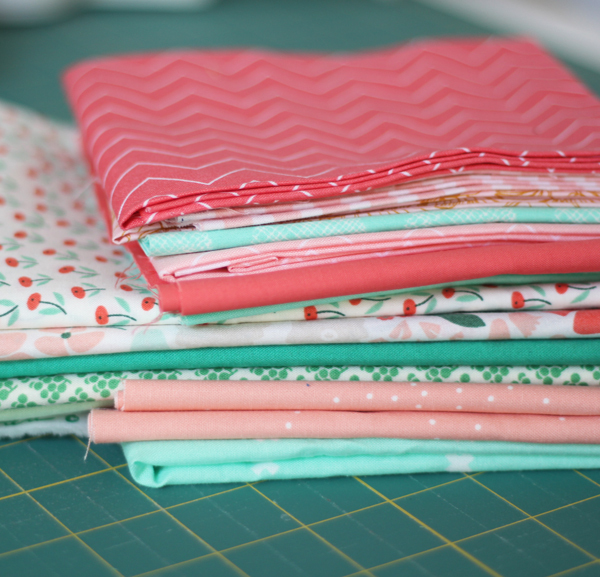 I can always pull some coordinating basics and solids from my stash and have a stack ready to whip into a quilt! The photograph makes the butterfly color look orange, but it’s actually a pretty rose coral color. I’m trying to decide if it’s too early yet to make baby girl a quilt…but since I’ll probably make her at least 4 I might as well get started now! 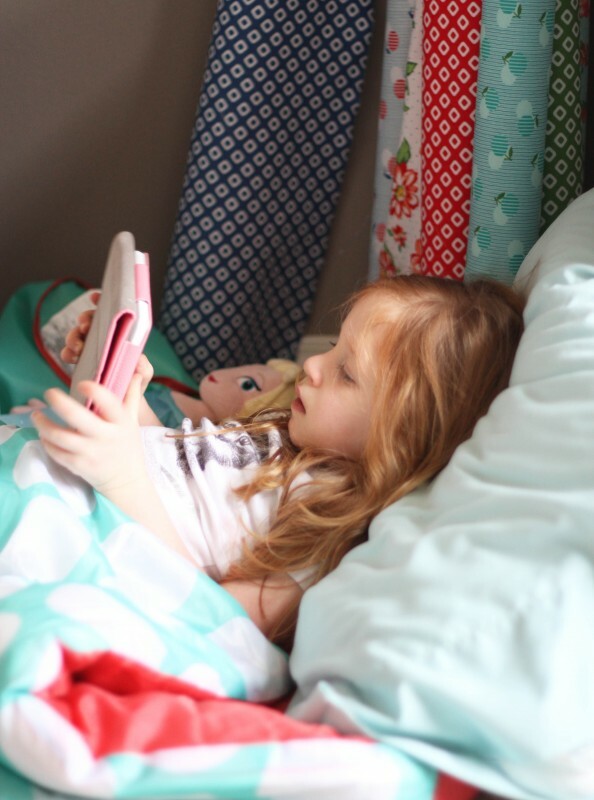 Sophie has given up naps for good…so she has “quiet time”, which usually means she brings her sleeping bag and a pillow (she’s obsessed with her sleeping bag! ), all her dolls, barbies, books, and kindle into my sewing room and sits at my feet. She’s my favorite 3 soon-to-be 4 year old ever. Never too soon to start a quilt for the new one! Congrats!!! That Sophie is too sweet.Already almost 4?? I remember when your 2nd SON was born! Best of luck!! oh my, she is adorable. ..such pretty hair. I think, the fabrics you chose will make a great quilt not only or a baby girl. …make it big enough to use a while. Beautiful fabrics and beautiful child! Thanks for the gismo review! 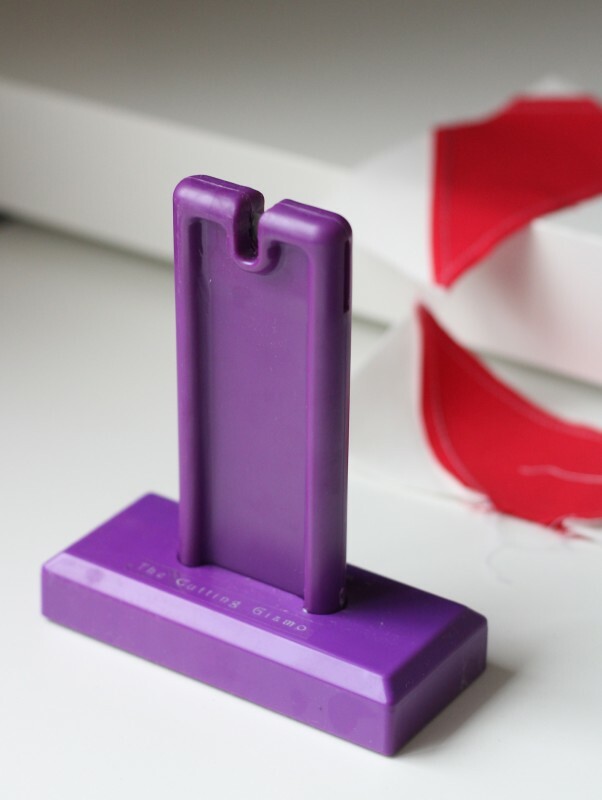 If the purple one is too tall, you should try the EZ Quilting Thread Cutter. It’s the orange one you see all over Instagram. The blade is housed in a sturdy triangle base and is made in the USA; which is always a plus. Thank you Kristy! I’m going to try it too!! I love that Park Life, just no one to make a quilt for. Can I come rest by your feet and watch you sew? Children grow too fast. It just is not fair! I’m glad I have grandkids but they are growing up fast too! Hi Allison, I can’t believe that little doll is already going-on-4! I’ve been following you since you were pregnant with her, and it seems like only yesterday. 8-) Lovely fabric, and I can’t wait to see it turned into a quilt for that new little girl. When my “baby” (now 32 and just married), was about that age, I would get tired in the afternoon and want to nap myself, but you couldn’t say that ‘n’ word, because she was too busy touching things and learning stuff. I would tell her, “come lay down and take a rest with mommy”, and that always worked. I would lay down on the couch and she would grab her pillow and lay down behind my legs. Even though I was the tired and sleepy one, she was always asleep before I was…..lol. loving this gadget till I went to amazon and it was £35 will have to manage with the scissors! Oh it’s definitely not worth that much! I wouldn’t pay more than $15 us for it (which I think is how much it usually should be!). Great gadget! Beautiful fabric and cute daughter! I love the colors you pulled for your 1st baby girl quilt! :) It’s going to be gorgeous! So sweet of Sophie to keep you company- she’s just the cutest ever! Park Life is actually designed by *Elizabeth* Olwen (http://www.elizabetholwen.com/cloud9-fabrics). And yes, I love my cutting gizmo. It’s not only easier on the wrists, it’s quicker and easier than using scissors. And no accidental snips in wrong places. Oops I knew that too! Teaches me for writing posts late at night…fixed! Love your baby. She is a good girl, what a little sweetums. Aww, Sophie and her quiet time while you sew is just too precious Allison. I remember those days well…. only for me it was gardening. Those fabrics will make a beautiful baby girl quilt. You just got me to order and thread cutting gizmo too. Quiet time is great and you can get some sewing done! A baby can’t have too many quilts! Love that fabric and that gizmo looks pretty cool! I have one of those Gizmo’s too and I love it. Love the fabric too! Love those fabrics and colors, how fun! Oh my, such a lovely pile of fabric! Interesting tool. I try not to get swept into buying every fun little thing but I might just have to try this one! Allison! what a beautiful little girl! Kathy O and I sewed together this last weekend…she was making a great! quilt out of one of your patterns! Isn’t she the best! we talked a little about you and decided the same thing…isn’t she the best! :) We were in Eastern Idaho to boot! yay! I can see why you like those kinds of prints. 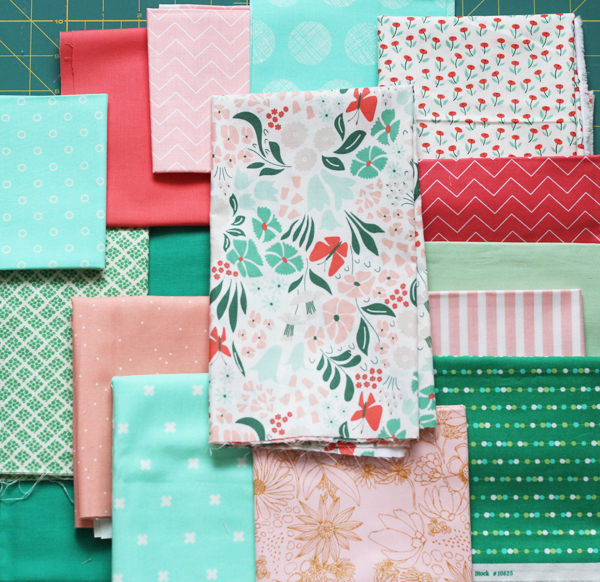 You have an eye for picking out coordinating fabrics. How inspiring! What a beautiful, sweet little girl. Can’t wait for the new little one to arrive. She will be such a sweet big sister.